Joel wanted to know if I could share any tips on kickstarting and continuing sketching practice, so I thought about my process for getting better at drawing. Here it is! 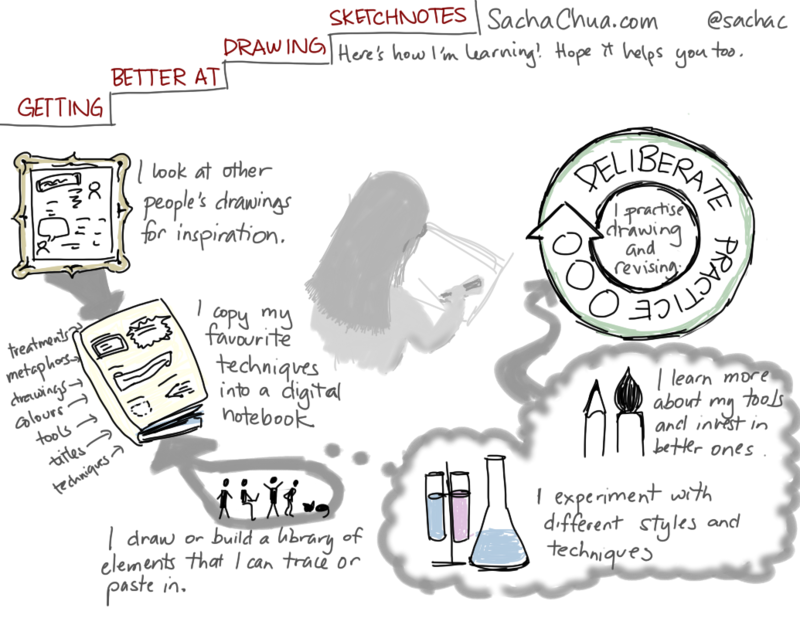 Collect inspiration: With the growing popularity of sketchnotes and visual communication, there are plenty of great examples on the Net. I like checking out Sketchnote Army and Ogilvy Notes for inspiration. 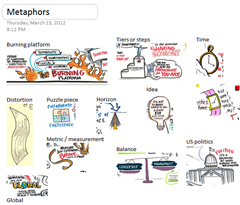 I often search for sketchnotes using Google Blog Search or Google Image search. 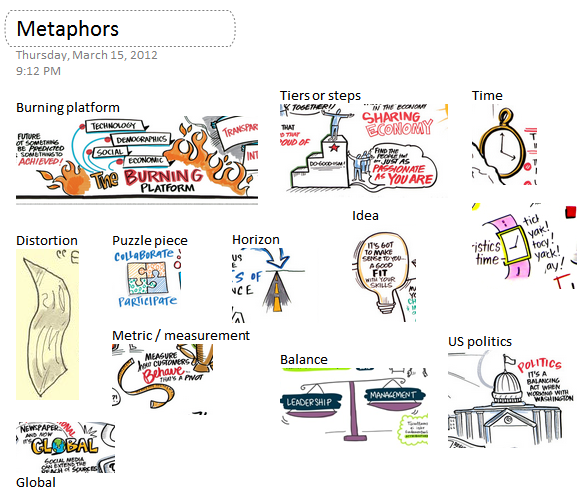 I use Evernote to clip the ones I like so that I can search for them using text. I look for inspiration elsewhere, too. Shop displays sometimes have interesting colour combinations, and paintings and photos are also great for colour and composition. Cartoons and comics give me visual metaphors and humour. I pick up ideas from books and presentations, looking for good things to share and interesting ways to share them. Compile a notebook: I use Microsoft OneNote to collect parts of the different images that inspire me: title treatments, visual metaphors, colour combinations, techniques, and so on. I like using OneNote for this because the keyboard shortcut (Win+S) is an easy way to capture part of the screen, and because OneNote makes it easy to organize elements on pages within sections of a notebook. Text labels make it easy for me to search the notebook for the keywords I’ve added to each of the images. Organizing the elements like this means that I can quickly find a specific element or browse around for quick inspiration. Build a library: Background templates, reference photos, and reusable elements (parts of past drawings, for example) help me work more quickly. I can paste them in from my OneNote notebook, image searches, or my photos and files. I can also use Add Image to add a file as a new layer. I can then adjust the opacity, scale and rotate things a little, and trace the image or use it as the basis for a different drawing. I sometimes use a light grid as the background when I draw, as my lines and text tend to skew upwards if I don’t. I’m planning to collect stick figure and cartoon poses so that I can draw people with more detail and flair. Because Autodesk Sketchbook Pro is a raster program, I lose some detail when I scale images up and down. Still, the library is great to use for guides or templates, and it’ll grow in usefulness as I draw and save more. Colour combinations are good to save, too. I like seeing how other people use colour to highlight their work, and I’m gradually getting the hang of it. Autodesk makes it easy to save the colours I like, and there are some colours I find myself returning to often. Experiment: There’s so much to experiment with and learn. I’m trying out different ways of hand-lettering, playing around with the letter forms and what feel they evoke. I’m experimenting with colour, line widths, layouts, whitespace, and flourishes. I’m playing around with different ways to learn and summarize information. I’m a long way off from settling into one style. Who knows, I may end up experimenting with this throughout my life. This is a good thing. Learn how to use your tools: I also invest time into learning and experimenting with tools. Over the past few days, I’ve been going through the trial versions of Autodesk Sketchbook Designer, Adobe Illustrator, and Manga Studio EX. In terms of pen-friendly computing, I still prefer Autodesk Sketchbook Pro, although I wish I had some of the capabilities I saw in the other tools! I like reading the documentation and watching other people’s videos because I often learn how to work more effectively. Practice deliberately: And of course, there’s practice. The more I draw, the more comfortable I’ll be at drawing, and (probably) the better I’ll be, too. It’s not just about drawing new things. Deliberate practice – going over and over small things – helps a lot, too. For example, I often fill a page with freehand circles. Then I add eyes, nose, and mouth to each of the faces, playing around with different expressions or trying to get the same expression each time. I also draw lines, as I find those hard to do (my hands are a little shaky). Tracing helps me learn more about drawing, too. Those are six ways I’m working on learning how to draw better. How are you learning?